Positech Corporation, the leading manufacturer of material handling equipment in North America announced the release of their new LodeArm® II overhead industrial manipulator, the newest addition to the Positech® line of articulated jibs. The LodeArm II is a lightweight pneumatic manipulator that provides excellent maneuverability of payloads up to 350 pounds. 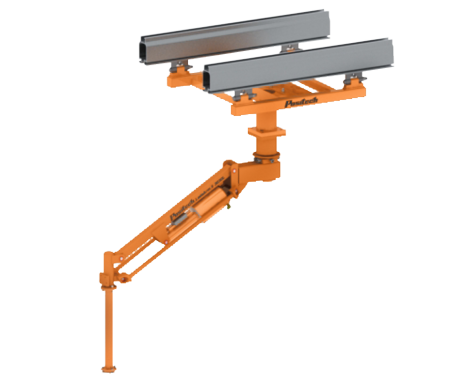 It is mounted on an overhead trolley which can be integrated with a variety of overhead rail systems. This ergonomic lift assist is specifically designed to reduce the physical stress of applications which require lifting, transfer and positioning of parts. The LodeArm II excels in assembly lines with high cycles and repetitive applications in tight work cells. Easily adjustable to fit almost any work cell, Positech’s LodeArm II is a high-capacity lift system in a very compact package. These units provide rigid support and reach-under capability. Ergonomically designed up/down controls reduce potential for thumb and wrist disorders. The LodeArm II is available in two models. The 4500 functions in low headroom spaces, with a horizontal lift arm that swings downward 45°. The 3030 Model has a horizontal lift arm that travels 30° up and down. Specialized pneumatic circuitry, customized end-effectors and operator controls are available to meet any application requirement. Positech Corporation has a unique and unbeatable combination of experience, customer service and service after the sale. The vast array of material handling products such as articulated jibs, ergonomic lift assists, custom end-effectors and torque reaction arms make Positech Corporation a leader in their industry. For more information contact www.positech.com.